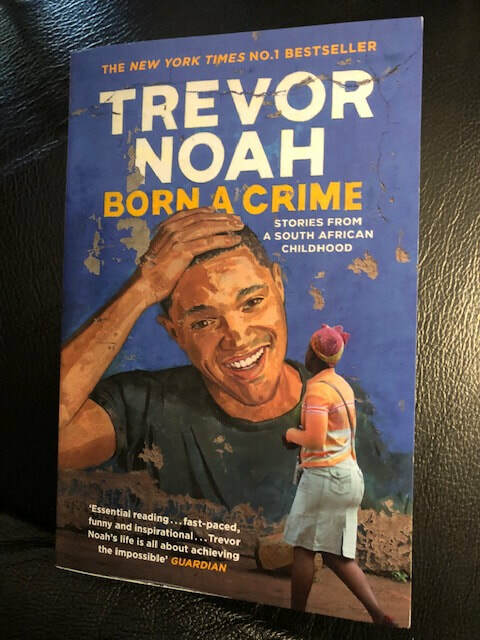 Born a Crime, Trevor Noah's memoir and autobiography about growing up in Johannesburg during apartheid and the turbulent times that followed, is a story that would resonate with any adult, young or otherwise. I laughed out loud in places, but really, this is an emotional story that tells of overcoming poverty, hatred and abuse. This book belongs in our Senior Years classrooms, alongside other powerful memoirs such as The Glass Castle and A Long Way Gone. Yup, it's that good. I am always on the lookout for stories with Indigenous characters to add to our classroom libraries. 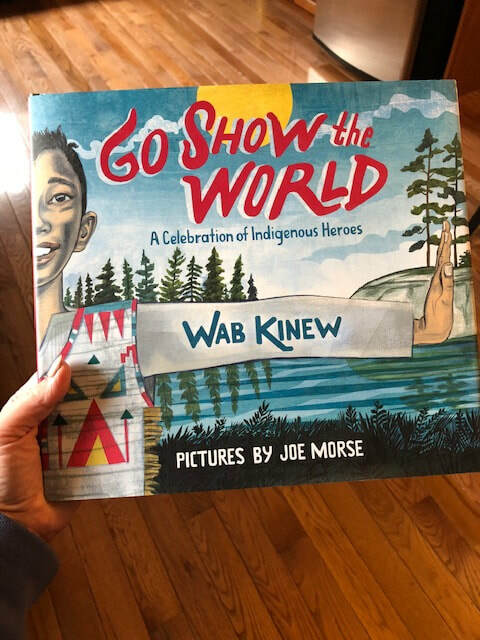 This one really appealed to me because, although it focuses on Indigenous people who accomplished amazing feats, it is written by a fellow Manitoban, Wab Kinew. Go Show the World: A Celebration of Indigenous Heroes, includes snippets about Jim Thorpe, an Olympic gold medal athlete, Beatrice Culleton Mosionier, author of In Search of April Raintree, Francis Pegahmagabow, the most highly decorated First Nations soldier in Canadian military history, and Dr. Susan Laflesche Picotte, one of the first Indigenous doctors at a time when female doctors of any cultural background were extremely rare. All the heroes included are brought to life by acclaimed Indigenous illustrator Joe Morse. "We are people who matter. Yes, it's true. Now let's show the world what people who matter can do." Such an uplifting message! 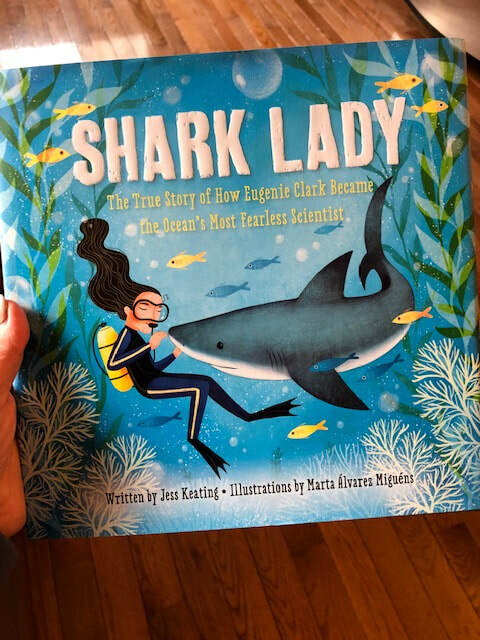 Another recent find, Shark Lady: The True Story of How Eugenie Clark Became the Ocean's Most Fearless Scientist, is the story of a woman who was determined to prove wrong those who didn't think women belonged in science. This purchase was a no-brainer, really, because I love anything that Jess Keating writes. Eugenie Clark devoted her life to learning about sharks, and has taught the world that sharks are to be admired and respected, and women in science, too! Full of great information about sharks, this book is sure to appeal to many of our students, I highly recommend this as an addition to your classroom library! Song of the Wild: A First Book of Animals is by Nicola Davies, a zoologist whose books are filled with beautiful words and illustrations. Each page spread is about a different animal and includes various types of poetry and illustrations that closely match the prose. This would make a great addition to Early Years and Middle Years classrooms, and I encourage our teachers to use it as a mentor text for teaching writing poetry. I've been a fan of Atticus' poetry for some time now, and I highly recommend following him on Instagram. 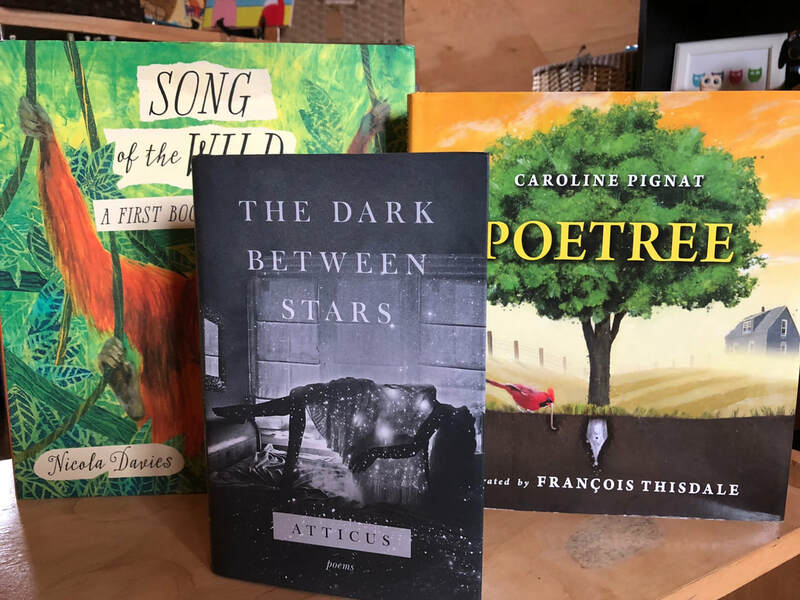 The Dark Between Stars is his newest book, and the minimalist prose provides a great opportunity for students to dip their pens into their own forays into writing poetry. Suitable for Gr. 9+. ​This is a remarkable graphic novel that explains the heartbreaking and hopeful story of the Syrian refugees - how the civil war in Syria began, and followed by a timeline events including where the refugees first fled, to the opening of borders, to the closing of borders. I would say it is more of an account than an actual story, but the information contained is so necessary for us to know. 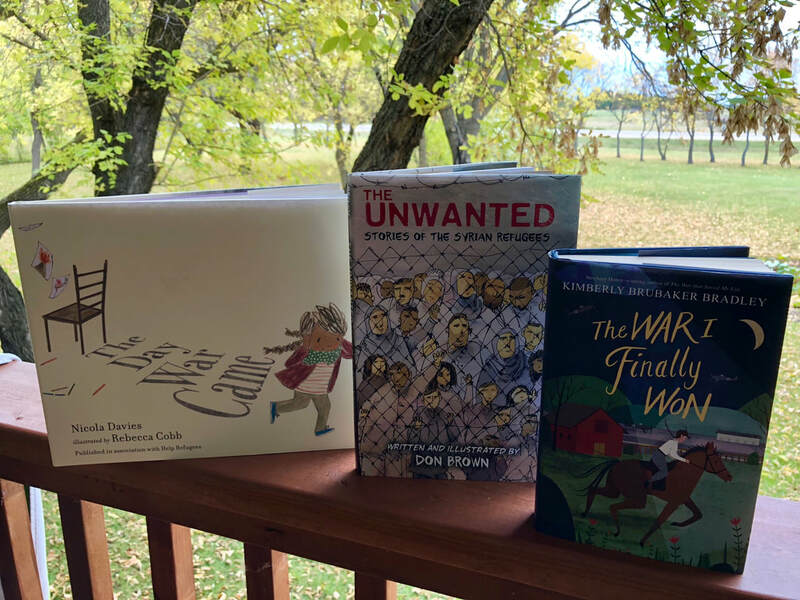 This would be an excellent addition to a senior years classroom, or a middle years classroom as part of a text set (with Refugee by Alan Gratz, Stepping Stones by Margriet Ruurs, and The Day War Came by Nicola Davies below). Inspired by true events, this story tell the experience of a young refugee child who makes her journey all done. The book was founded by the Help Refugees movement and is told lyrically by award winning Davies. This picture book is sobering and promotes the idea that a simple act of kindness can go a long way, even in the wake of war. I highly recommend this book for middle and senior grades. The prose would make a great mentor text for any ELA classroom! Oh my gosh! I have been waiting to read this sequel to The War That Saved My Life, and I was not disappointed! Ada's story is one of a young girl sent to the countryside as an evacuee from London during WWII. In the first book, we learn of Ada's trauma and how it affects her - physically and emotionally. This book continues, and we see how Ada's spirit and selfless love affect her own and others' stories. The book is filled with historical elements, and the messages of bravery, truth and kindness make this a truly remarkable read for middle grade and older students (I personally loved it!). Although the book could stand alone, I do recommend reading book one first. This collection of books are all related to emotions such as sadness, grief and empathy. Tough topics to broach with kids, but necessary. I'm Sad is a sequel to I'm Bored, both by Michael Ian Black and Debbie Ridpath Ohi. Everyone feels sad sometimes, and that's OK. What makes this book so awesome are the characters, the illustrations and the light touches of humour (I laughed out loud at the potato). The sad flamingo shares his feelings with a little girl and a spud, and together they decide that feeling sad is normal, but discussing feelings does make one feel better. Even if you're sharing with a potato. I would recommend this book to kids up to 12 years old. ​Deborah Ellis has been one of my favourite authors for middle years students since I read The Breadwinner series and The Cat at the Wall. Sit is a collection of eleven short stories of children faced with hardship, who find the courage to take control over their own lives. Each tale features a chair, and adults who are not very helpful or kind to children. From a child labourer, to a child refugee, to a the dreaded time-out chair, Deborah Ellis delivers this series of dark tales with a sense of hopefulness and empathy. These would be great in a middle years or senior years classroom. 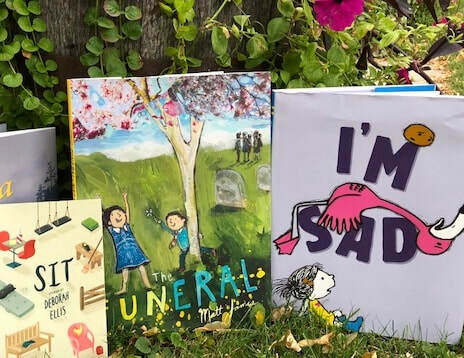 The Funeral is a picture book by Matt James, a sensitive story of grief that is perfect for children who may be dealing with a death in the family. In this story, Norma travels with her parents to the funeral for her great-uncle Frank. She's sad about her uncle, but happy to spend time with her favourite cousin. Conflicting feelings and questions abound as the two children learn about some of the rituals associated with funerals. Great for early years kids. Cute as an Axolotl and What Makes a Monster? by Jess Keating, with illustrations by David DeGrand, introduce readers to some of the most fascinating creatures on earth. 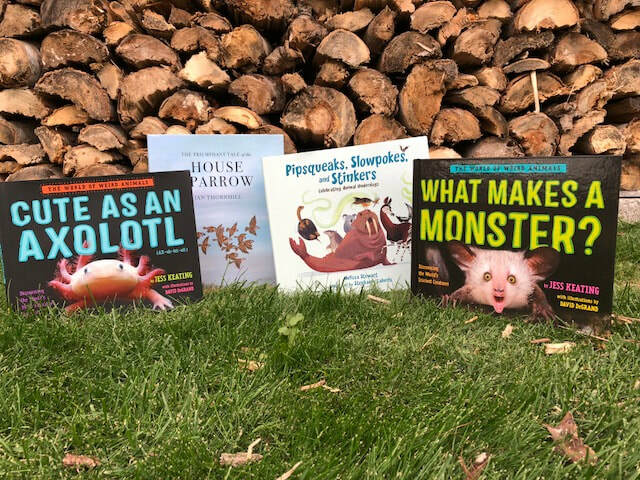 In Axolotl, you'll learn about the more adorable animals on earth, including the pom-pom crab, pygmy hippo and dwarf flying squirrel (look them up - they're real!). Monster features the world's scariest animals, including my personal favourite (although I never want to meet it!) - the horror frog (shudder!!!!). The text features provide great opportunities for teaching how to read non-fiction, and if the fascinating information doesn't grab you, the notes at the back of the book will. Why do we perceive some things as "cute," and others as "scary?" This is a great opportunity for a unit on how humans create perceptions, but also how we may differ in opinion. These two texts and Keating's Pink is for Blobfish make up a trilogy you'll definitely want to own! The Triumphant Tale of the House Sparrow follows The Tragic Tale of the Great Auk (a Canadian Children's Literature Award winner), both by author Jan Thornhill. Unlike the Great Auk, the House Sparrow has thrived for thousands of years, thanks to its ability to adapt to its changing surroundings. How and why has it changed over the years, from Ancient Egypt, to Europe, to North America? And why is it so despised? I love both of these books for the opportunity to teach about animal adaptations, and the how humans affect nature. ​My brand new book (just released this week!) is Pipsqueaks, Slowpokes and Stinkers: Celebrating Animal Underdogs, written by Melissa Stewart and illustrated by Stephanie Laberis. This book informs the reader about animals that are considered underdogs, due to their clumsy, shy, slow, stinky, and other unfortunate attributes. I learned about some creatures I have not heard of before, including the zorilla (I love that name!) and the hoatzin, and celebrated some of my all-time favourite animals, including the naked mole rat. The text is lively, conversational, and funny, and young children will eat it up! This book is a must read for all children in our Early Years classrooms. Perfect for the first day of school especially, but any time we need to send the message that everyone belongs. I love the diverse characters and the different kinds of families that are featured. Beautiful illustrations by Suzanne Kaufman add to the celebration of diversity and inclusion. Based on the memoirs of the author, this book features a 10-year old girl who helps out at the hotel that her immigrant parents manage. She is able to keep a lot of secrets, including the fact that her parents hide immigrants who need help. 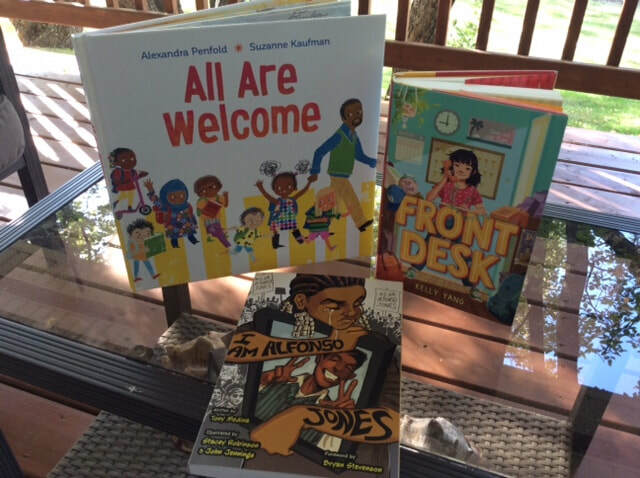 Themes of racism, immigration and poverty make this is a book relevant to today's world, and messages that we need to discuss with our students and children. Teaching ideas scream out at me almost every time I turn the page. An awesome addition to any Middle Grade kid's library. Graphic novels are so popular right now, and this beautiful book would made a perfect pairing with The Hate U Give by Angie Thomas (soon to be released as a movie - can't wait!) or Just Mercy (just read it this summer as part of Penny Kittle's Book Love teacher book club) by Bryan Stevenson. All of these books tackle themes of police brutality in the US, the Black Lives Matter movement and poverty issues. This story is about Alfonso Jones, who is shot by a police officer while buying his first suit, as the officer mistakes a clothes hanger for a gun. Alfonso, as a ghost, rides a ghost train to learn of other people's struggles for equality and how his friends and family deal with his death. I highly recommend this book for high school students.